Yessss. It's bloggers who've turned this into a national spectacle, not at all the politicians and mainstream media reporters who've decided that there's worth in repeating the drivel that fringe conservatives put up on the web without any due diligence. 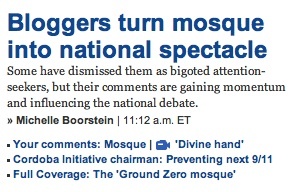 Take the phrase "Ground Zero Mosque" that's so prominent here. Or, hey, let's take a look at the piece that's under that headline. Long before President Obama waded into the vociferous debate over the so-called Ground Zero mosque, a group of conservative writers and bloggers critical of Islam had seized on the issue and helped transform it into a national political spectacle. While some have dismissed them as bigoted attention-seekers, their attacks on the proposed Islamic center in lower Manhattan have gained currency in recent weeks among some Republican leaders. And their influence appears to be growing. Did you catch that? Some people -- don't know who, but they sound disreputable -- think that the people who write about the Park 51 Islamic Community Center being some kind of wellspring for birthing American-born terror babies are nuts. But not the Washington Post! The Post takes those bigots seriously, because they're influential. They are organizing a Sept. 11 rally against the proposed Islamic center in lower Manhattan that will feature former U.S. House Speaker Newt Gingrich. They advise the FBI and other government security agencies on the threats posed by Islamic radicalism, headline "tea party" events and attract millions of readers concerned or curious about Islam to Web sites with names such as Jihad Watch, Creeping Sharia and Stop Islamization of America. "People on the Hill, their staff read these sites, they show their bosses. . . . They push these subjects into the spotlight, often at a time when major media isn't doing that," said Cliff May, a columnist and former spokesman for the Republican National Committee who runs a think tank focused on religious extremism and religious freedom. So, they "advise" the FBI. Doesn't that sound official? Strange how JihadWatch isn't listed as an active partner on any of the FBI sites. I'm sure that the reporter, Ms. Boorstein, just failed to mention her source on that one, too. Surely it was someone at the FBI, not just an eager conservative who lists "advises FBI" on his resume because, once upon a time, someone at the field office picked up when he placed his eighteenth "THERE ARE MUSLIMS OUT THERE OMG!" call of the day. Jihad Watch is widely read in many quarters in Washington, particularly among conservatives. Daniel Pipes, perhaps the most prominent U.S. scholar on radical Islam, said he considers Spencer a "serious scholar." "I learn from him," said Pipes, director of the Middle East Forum, a conservative think tank, who writes a biweekly column for the National Review. Hey, wait, is that the Daniel Pipes whose appointment to the U.S. Institute of Peace the Washington Post editorial board once called "a cruel joke" that should be "rescinded"? Oh, yep, it is. And Michelle Boorstein knows it: She even blogged about how Pipes is "certainly considered hostile to Islam by many Muslim-Americans and Arab-Americans" today, in a separate piece at the Washington Post. Of course, if I were just reading the front-page news, I'd never know that Pipes is raising money for the defense of a Dutch politician "who has advocated banning Muslim immigration to his country and the Quran," or that Pipes sees "an attempt to impose Islamic law, sharia, in the West" as a major threat. This whole piece is a disappointing, troubling mess. I'm willing to grant the premise that attention on some conservative blogs may have gotten the ball rolling on the Cordoba House initiative, but what's kept it going is the absolute unwillingness of mainstream media writers and television reporters to call this what it is: not some movement of thoughtful, scholarly people, but an explosion of bigotry.